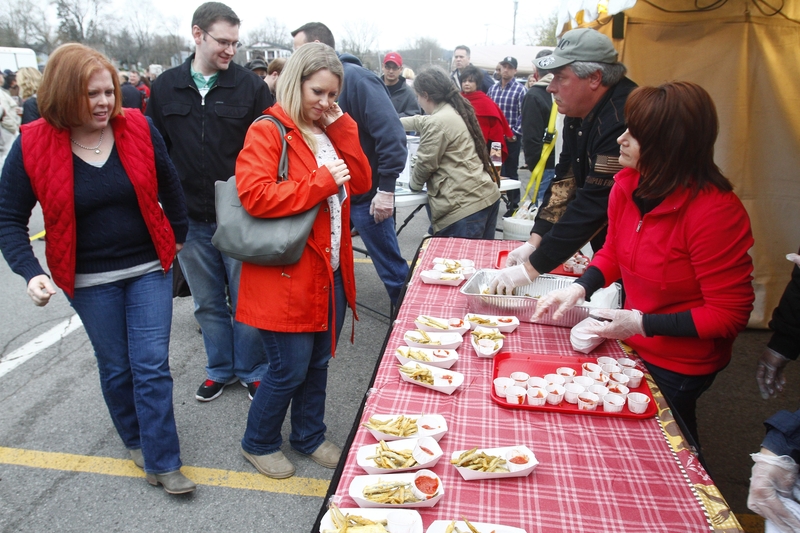 Crowds gather for smelt at the 2014 Smelt Festival on Center Street in Lewiston. LEWISTON – Whether you are a fisherman or not, smelt – a small freshwater fish that run in schools in the lower Niagara River – are the first sign of spring. And their arrival marks Lewiston’s first foray into its busy festival season. Beginning at 6 p.m. on Friday, the Niagara River Anglers will batter and fry the smelt, which are given out free until supplies run out. While the samples are free, donations to the organization are encouraged. Live music, additional food and beverages and a beer tent will also be offered through 9 p.m. on Water Street, at the foot of Center Street. For those who can’t get enough of the tiny delicacy, most restaurants in Lewiston will be serving up their versions of dishes with smelt throughout the weekend. Participating restaurants can be identified by a decorative fish flag. Smelt are often fried and usually eaten whole. Needless to say, the non-initiated often turn their nose up at them – until they get a taste. Fishermen were coming to Lewiston to dip for smelt for many years before the festival was established. Smelt is one of the few fish that sportsmen are allowed to net and the state Department of Environmental Conservation deemed Lewiston one of the best places in the country for smelt dipping. “Local fishermen have been dipping for their smelt and frying it without a festival for years and years. Since 2001, it morphed into more of a festival event,” said Jennifer Pauly, president of the Niagara River Region Chamber of Commerce. Calogero Soldano, chef and co-owner of Casa Antica, said the Italian-American restaurant at 490 Center St. has had smelt on the menu in the spring even before the festival started. He said they have come up with five different styles including the most popular – Agro Dolce, where the smelt are lightly seasoned, pan fried until crispy and served in a sweet and sour sauce, which is a combination of the pan juices, a little bit of both red and apple vinegar, and sugar. “I’m not always a big fan of smelt, but I always sneak a bite of this one every time it is here,” Soldano said. The restaurant also will offer Francese, which is crispy fried smelt in creamy light garlic, white wine and lemon sauce. A more spicy dish is Diavolo, a spicy marinara sauce with banana peppers and a lot of basil and fresh tomatoes. Ken Bryan will have specialty smelt offerings at his restaurants. He owns the Brickyard Pub and BBQ, 432 Center St.; Tin Pan Alley, 775 Cayuga St.; and Center Cut, a steakhouse which opened up in November at 453 Center St. He also owns Brio’s Pizzeria on Center Street but, alas, will not be serving smelt pizza. At the Brickyard the smelt will get a house rub, which is usually reserved for chicken wings, and will be served up with fries. “Tin Pan usually has some kind of a Cajun mix,” Bryan said. This is the first time for Center Cut to be part of the festival and head chef Emily Lonigan said it will offer a crispy battered smelt with roasted garlic, roasted red peppers and Italian basil. “It’s a good weekend and it brings in a lot of people,” Bryan said. • Apple Granny’s, 433 Center St., has a good old-fashioned smelt-style fish fry and has been part of the Smelt Festival for many years. • Bailey O’Riley Village Pub, 840 Center St., which took over the Lewiston Village Pub last summer, will dive into its first Smelt Festival with breaded fried smelt with fries and coleslaw, as well as a smelt in garlic sauce. Owner Chris MacKenzie said the festival is such a great event that they wanted to be part of it. • Carmelo’s, 425 Center St., also has plans to be part of the smelt run of restaurants. • Water Street Landing, 115 Water St., will be in a perfect position to welcome the crowd as the festival moves closer to the restaurant, in the Whirlpool Jet Boat parking lot, right in front of the restaurant. Pauly said hundreds came out last year, despite 40-degree temperatures, and in the past they have regularly fried up more than 400 pounds of smelt at the annual festival. She said the new location will allow visitors to use restrooms at the Whirlpool Jet Boat’s visitors center and the band will play on the site’s patio. The festival is presented by the Niagara River Region Chamber of Commerce and the Village of Lewiston in cooperation with the Niagara River Anglers. Sponsors are DiMino’s Lewiston Tops Market and Whirlpool Jet Boat. Additional funding to purchase the smelt is provided by Chemical Waste Management.